I have to say that in our family, although there have been many struggles, we have not had to shoulder the burden of someone having cancer. This book made me feel like I was part of their family in a way. 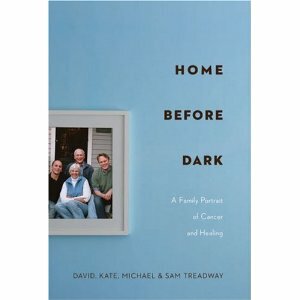 It is a diary type story of the journey one family takes through a fight with cancer. Each chapter recalls all events from when the family first found out, to all of the things that took place throughout the process. Every new chapter has the family members name as the title telling you that they are “speaking” in this segment. Dad is the patient and a therapist, Mom is a doctor and they are a close knit family. It was interesting to get the wife’s thoughts especially since she understood even more than those of us who are not doctors what was happening to her husband. The other thing I found interesting was hearing about how all of their lives “went on” even through this ordeal and the guilt that ensued sometimes because of it. This story is heartbreaking, painfully personal at times, yet inspiring and refreshing too. I really enjoyed reading it and wouldÂ recommendÂ it whether or not you have ever faced this disease in your own world. Thank you Treadway family, for this deeply intimate look into your family’s life. I am sure not all would have the courage to give such a piece of themselves to others and I know many people will be better for having read it. Who Wants On My Blog Roll?